The rapid bull run in KLCI from December 2017 to January 2018 has brought in a new hope to many investors. As self directed individual investors, we might not have the full firepower of tools that professionals have. But charts itself are powerful and they will be able to level the playing field for us. 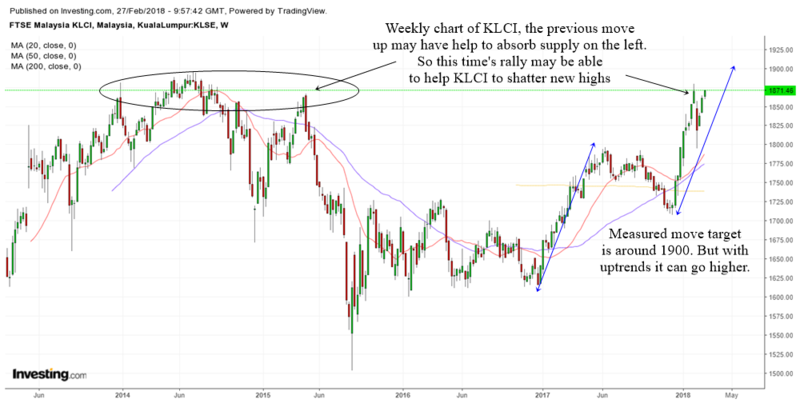 I have done quite a bit of analysis on the KLCI in Technical Analysis Of KLCI : January 2018 Market Outlook, so do take some time to have a look at the analysis as well. If you are interested in the technical analysis of individual stocks, go to Technical Analysis Of Malaysian Stocks. Everyday I analyze 1 or 2 Malaysian stocks for my friends. Strangely, I find it really fun and pleasurable to study Malaysian stocks. 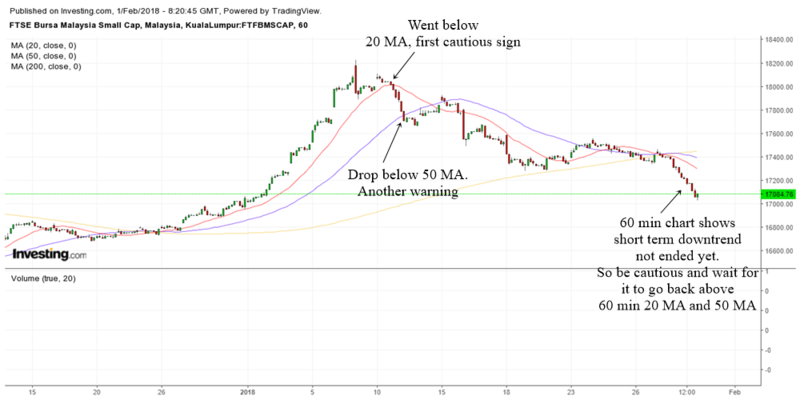 I will start off this month's analysis with an analysis of the Malaysian small cap sector as this is a request from one of my Telegram members. The chart above is the daily chart of Bursa small cap. 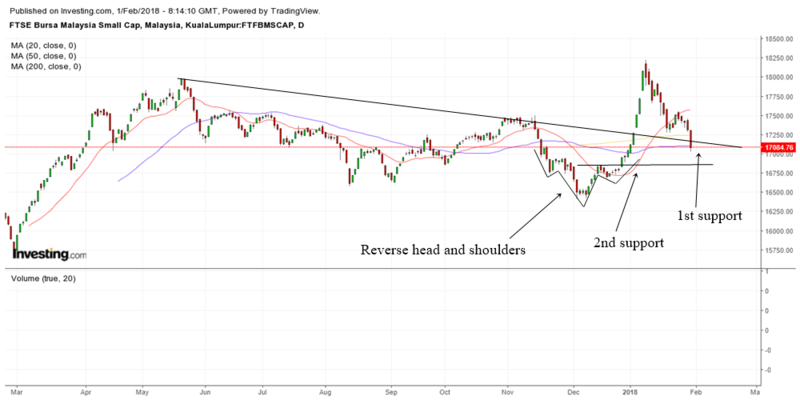 The recent nice run up happened after it formed a reverse head and shoulders bottom. But as it neared 18250, the index quickly dropped and brought a lot of small caps down with it. At this moment, the index is sitting at the 50 MA support which we consider to be support 1. The next area of support is the reverse head and shoulders area which we consider as 2nd support. 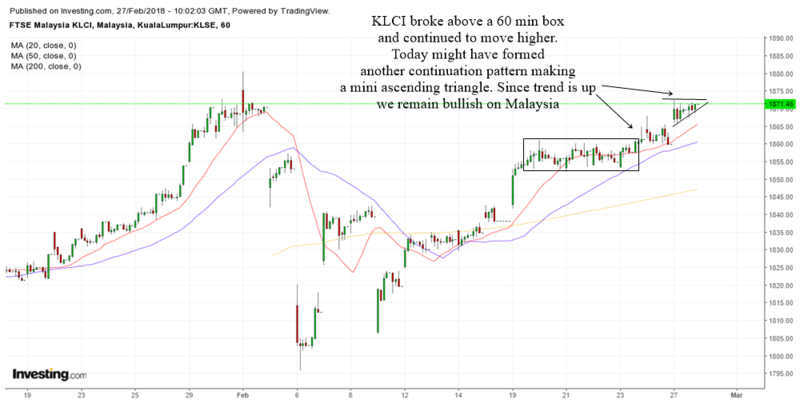 In order to gauge whether the supports will hold, we need to look at the 60 min charts to find a trend change. As long as the trend has not change in the lower time frame, it will be quite dangerous to touch small cap stocks. If any of your stock is a small cap stock, you need to pay attention to the sector chart. At least 75% of small cap stocks will be dragged down when the sector falls. The chart above is the 60 min chart of FTSE Bursa small cap. As you can see, the sector had a nice 60 min bull run which quickly ended after it drop below the 60 min rising 20 MA and 50 MA. Sector charts also act like stocks. They do not run up non stop forever. That is why a simple trend following method is important. You wont always be able to catch a short term top at the exact area it starts to decline. But at least you will be aware of the potential dangers. Those of you who follow my work know that I like to use the 20 MA and 50 MA. After the sector runs up too much, you should be cautious if it drops below the 20 MA. Then be more cautious if it drops below the 50 MA. At this moment there is no end to the short term downtrend yet. You want to see the sector move up above the 20 MA and then the 50 MA before a new uptrend can begin in the small caps sector. 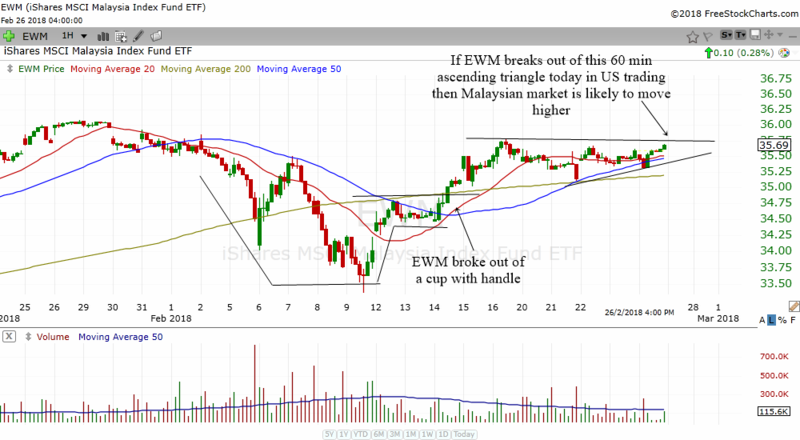 Let us now look at the big picture of the Malaysian small cap using the weekly chart. The small cap is one of those lagging sectors in Malaysia. It has not even been able to reach the old highs around 19300. 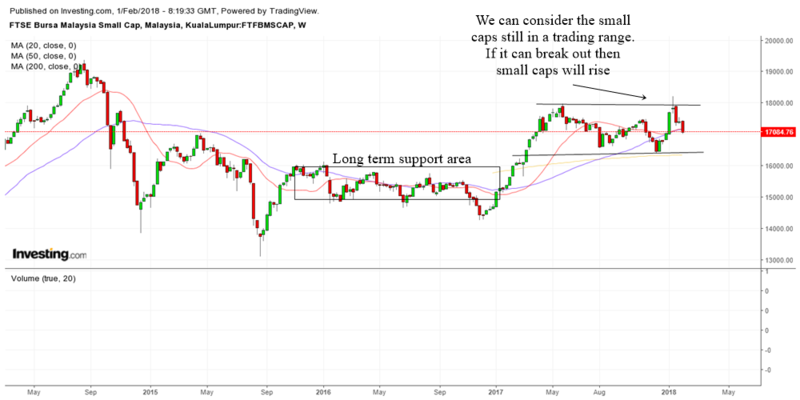 At this moment, we can consider the entire small cap to be consolidating or trading sideways in the weekly chart. There is ample support below so the bias is still to the upside. If the small cap breaks above the upper trend line, then only we will see another nice bull run up in small caps like in the first half of 2017.